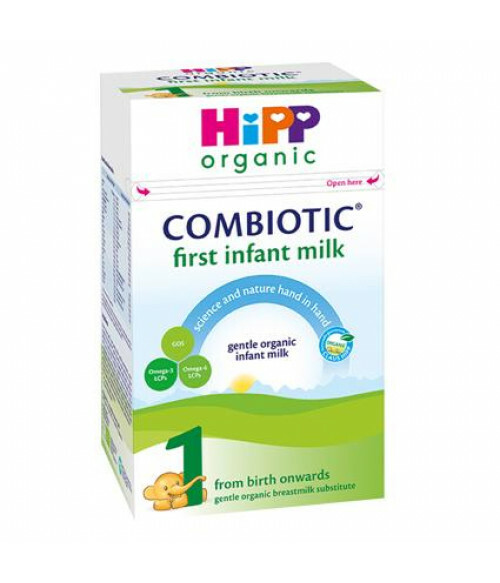 A nutritionally complete, whey based, gentle infant milk, which is suitable from birth on wards if baby is not being breastfed or to complement breastfeeding. Our gentle organic formula is specially formulated using only the finest organic milk and contains Omega 3 &6 LCPs (DHA & AA) and PRÆBIOTIK® oligosaccharides (GOS), as well as all the important vitamins, minerals and other nutrients(required by law) that babies need to grow strong and healthy. Organic skim milk, organic demineralized whey powder, organic vegetable oils (palm oil from sustainable organic production, rapeseed oil, sunflower oil, prebiotic fibers (galacto-oligosaccharides from lactose), organic lactose, LCP oils (fish, vegetable), calcium carbonate, potassium chloride, L-tyrosine, L-phenylalanine, vitamin mix (vitamin C, vitamin E, vitamin A, niacin, pantothenic acid, thiamin (vitamin B1), vitamin B6, folic acid, riboflavin (vitamin B2), vitamin K, biotin, vitamin D, vitamin B12), magnesium carbonate, zinc sulphate, L-tryptophan, iron sulphate, stabiliser (lactic acid), copper-lysine complex, potassium iodate, manganese sulphate, sodium selenate. My favorite store to order from cause they have good prices and very good shipping. My first baby was fed entirely on this formula for the first year as my wife cannot breastfeed due to the breast reduction surgery. For some reason, my first baby could not tolerate formulas from major brands including Enfamil, Similac, Kirkland (Coscto), and others - the results were diarrhea and gassiness. My wife has dairy allergy and gluten intolerance so perhaps that got inherited. After a very positive experience, we decided to feed our second baby on this formula as well and continue to have success. I absolutely love this formula 99% organic!